FROM LEFT, Andrew Verderber of Springfield Electric; Gener Eyre of Springfield Electric; Roger Tedrick, owner of the Tedrick Group; Chad Brandon, President and Certified Risk Architect of the Tedrick Group; Pam Allen, president of Clinton Electric and Owen Allen, vice president of Clinton Electric. 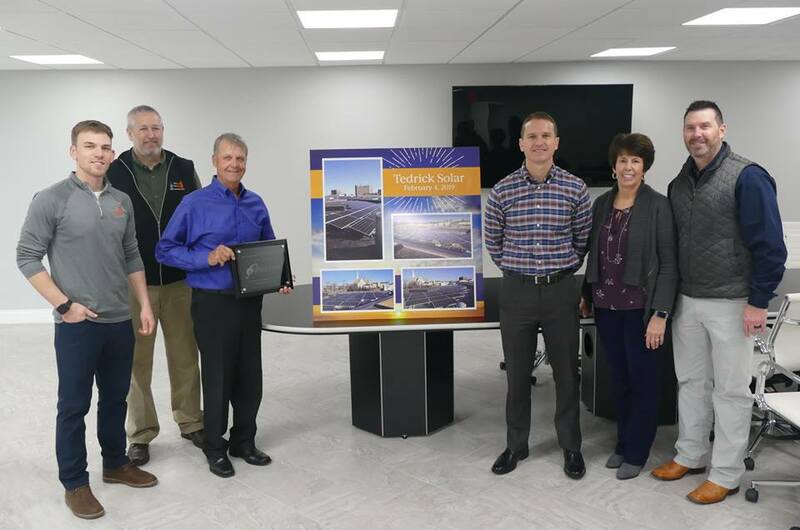 A ceremony was held Wednesday, February 27, 2019 to recognize the Tedrick Group for being the first commercial solar array system installed within the city. Pam Allen, president of Clinton Electric based in Ina, said that February 4th was the date where the system got energized at the Tedrick Group. "We are really recognizing two things today: the solar array being energized and the fact that the Tedrick Group is the first commercial solar array in the city of Mt. Vernon," Allen said, "That is really no surprise to me at all. We are a customer of theirs and we have been with them for many years for our insurance." Roger Tedrick, owner of the Tedrick Group, discussed the decision to have the solar array installed. 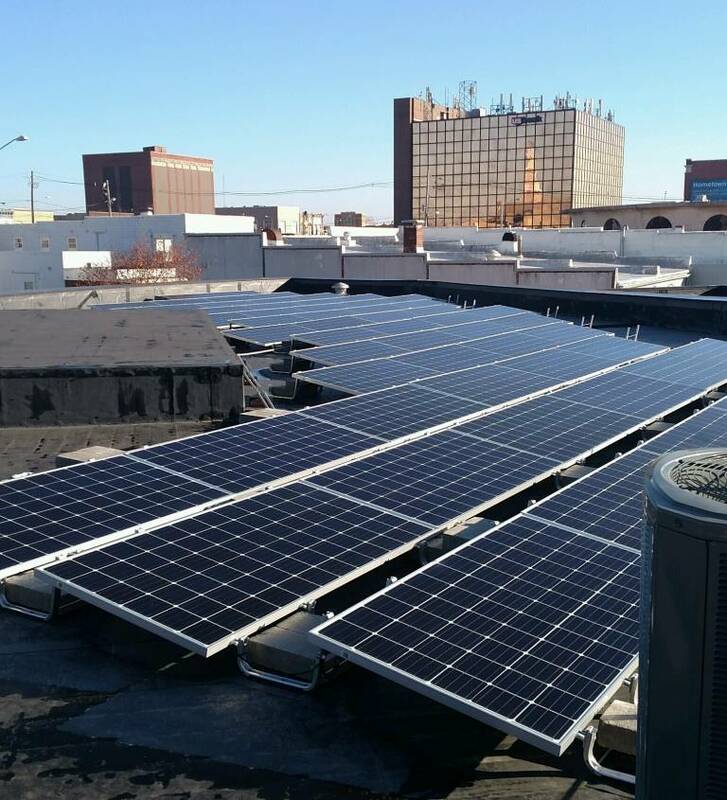 "We like to be on the cutting edge and the first one in the community to have solar on our building," Tedrick said. "We think it is the right thing to do. When we first approached it with Clinton Electric, we had that discussion and cost was a factor of course, there are tax credits." "It's still a leap of faith. You still have to feel like it is the right thing to do," Tedrick said. "I hope it is a catalyst for other people to look into it and go down this path." The total cost of the system was $70,369, with some tax credits helping to offset the cost. Darren Volle, energy team leader of Springfield Electric, which has a branch office in Mt. Vernon, discussed their involvement with this project. "Springfield Electric is a distributor of electrical equipment. We have a team that Andrew [Verderber] is a part of and he designed and engineered it," Velle said. "That team goes around and puts together all of the bills and materials, the design of the system, consults with structural engineer on the roof to make sure it is structurally sound to hold the array. "Then we go in and we apply for all the rebates, speak with the customer about the tax credits, what the payback is going to be," Volle said. "That is what our team focuses on for the solar. Then we partner with Clinton Electric, who does all the installation and who has the relationships with the customers." The new system will require minimal maintenance, as Verderber shared some of the specifications of the panels that were installed on the roof of the Tedrick Group Building. The size of their solar array is a 22.7-kilowatt system. Allen commented on Clinton Electric’s relationship with the Tedrick Group. Allen gave her reaction to Clinton Electric being the installer for the system for the Tedrick Group. A plaque was presented to the Tedrick Group recognizing them for being the first commercial system array in the city, along with the date the system was energized.